First up it was a big welcome back to Karl Oakes. Although we were expecting a medley of his 50 new songs since his last appearance, the three he chose were all terrific. Here She Comes is taken from his soon to be launched ‘Invisibles’ band set – watch this space! Karl wrote it while listening to Roy Kibbler’s Summer of Love set last September. Can’t beat that for inspirational poetry! Phil Pipe’s set was a real treat as ever. His wistful song about George Mallory’s expedition to Mount Everest (aka Chomolungma) was perfectly balanced by the gentle humour of his songs about a disastrous holiday romance in Benidorm, and how Tiddles the cat led to Phil’s very own existence and indeed, his very entertaining appearance tonight. 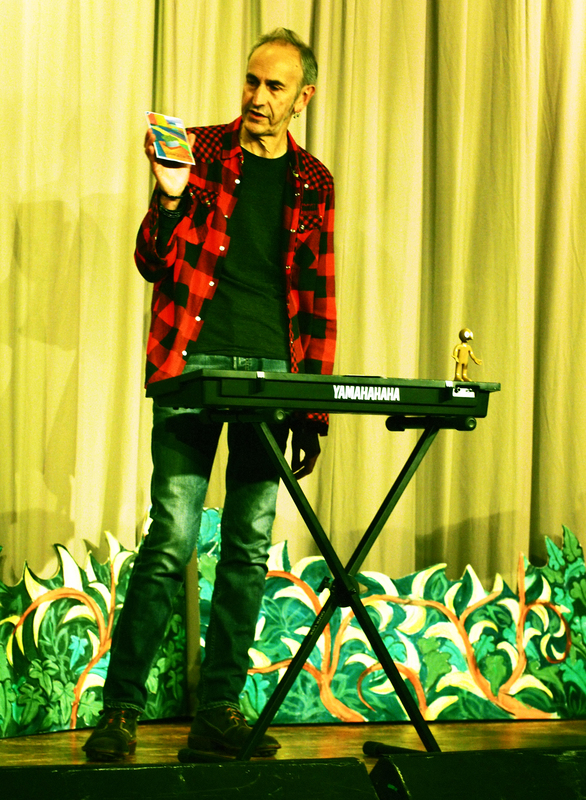 Next up, Andy Pyke played three flowing songs in his easy going style, with fine audience participation. I heard some especially good harmonies coming from the floor during Andy’s lifting rendition of Dougie Maclean’s Feel So Near. Next, there was a big welcome for Richard Poulson whose spirited set closed the first half. His acoustic version of his band-back-then Jump the Gun’s ‘All Over Town’ and his rendition of I am Kloot’s ode to drink and disaster -The Brink – were somehow reminiscent of Elvis Costello, and it was great to hit the cakes with Stray Cat Strut resonating all the way to the kitchen. Graham Beck opened the second half with a very funny story of how Batman and Robin stormed into town in style one day, compete with Batmobile, only to…open a shoe repair shop. The ensuing song ‘I am The Batman’ had everyone in the room grinning from ear to ear. Graham’s next song ‘Song for those not listening’ was very well listened to on this occasion (may I take this opportunity to thank our fantastic attentive audience who make Loudhailer Acoustic such good place to play). A great line for my blog came to mind as I was listening: ‘Graham Beck – all the members of Roxy Music rolled into one’. Rich & I played Graham’s rather excellent CD – A Bathful of Nasturtiums – this morning and the addition of saxophones was the icing on the cake Roxy Music wise. Great stuff. 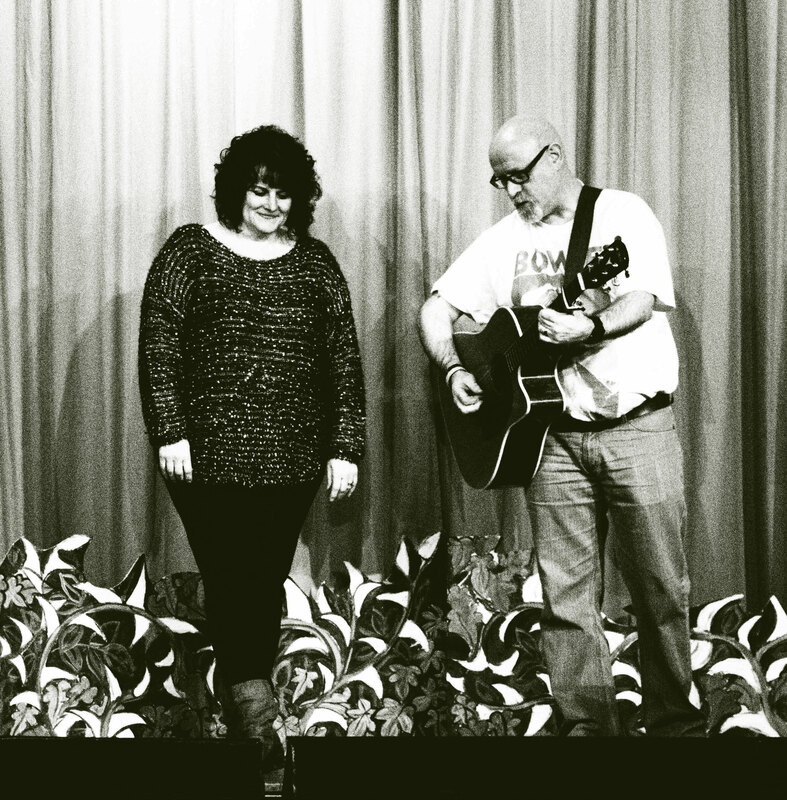 We were delighted to welcome Wakefield’s Lynn and Paul Harrison – Peculiar Blue – to Loudhailer Acoustic for the first time, with a set of finely crafted love songs, beautifully sung, some melodious descending chords and some fine strumming. Lynn and Paul’s special voices harmonised perfectly. We listened to Peculiar Blue’s excellently presented CD today, and put a request in for our favorite two songs – Crocodiles and Occupation – next time Lynn and Paul head this way, hopefully soon! Next up a big welcome for new guest Verity Poulson who sang a delightful set of songs. 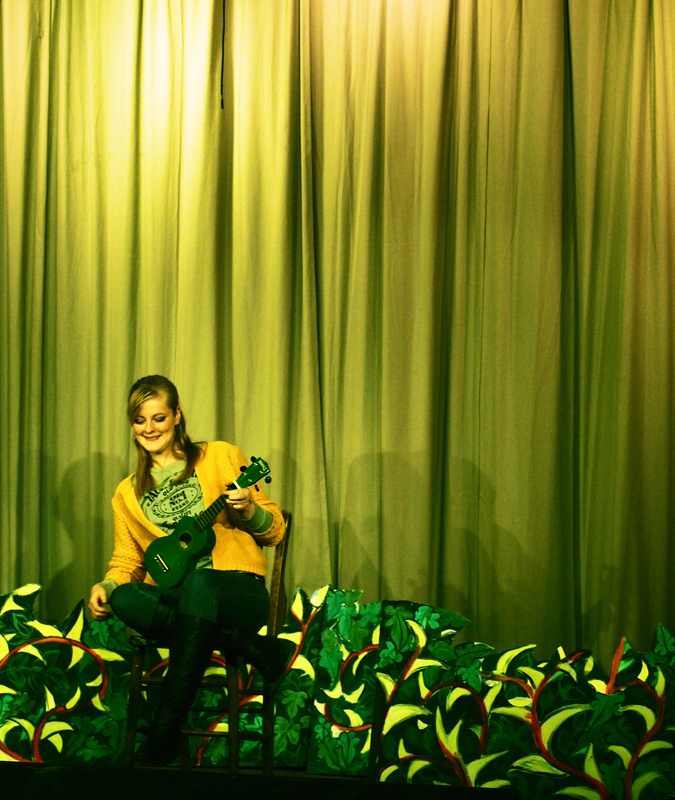 Verity’s King Blues track showed off her ukulele, before she moved onto guitar for some lovely finger tapping harmonics. Her silky version of Sixpence non the Richer’s Kiss Me, was preceded by our favourite of the set, Verity’s original composition Try and Explain. Really look forward to hearing it again. Jeff Parsons closed the show with one of my favourites – Loudshirts – featuring some fantastic and very funny lyrics and superb slide guitar. This time enhanced no end by not only a prize winning shirt, but….matching socks!! Excellent. Jeff’s new protest song L’Oréal advert inspired ‘Because You’re Worth It’ provokes thought about the value of womens’ work, from the life saving underpaid nurse, to the highly paid advertising models. The last song of the evening was another of the 62 new songs Jeff has written in the last 18 months (yes really!) The Defiant Generation. Definitely! Jeff’s Loudshirt and matching socks! For those interested – and I know some of you were, the supporting music for the evening was provided by the most excellent Junior Kimbrough. Many thanks to Penny and Maria for delicious baking and to Chris at Willerby MC Hall for having us, and for getting all the extra tables and chairs out. See you next time, new and familiar faces always welcome to play or listen. Saturday February 8th, doors 7.30 pm, 8 pm start at Willerby Methodist Hall, Willerby Square, East Riding of Yorkshire.